History: Indy, a pup of Tipp Rene, dam, and Atascocita Leroy, sire, had a long-running (pun intended) career. Indy’s career began July 7, 2013 and ended June 19, 2015, with 112 races to his credit according to Greyhound Data (and 120 according to Track Info), all at Gulf Greyhound Park. Indy is half-brother to another brindle boy, TAGS’ Gatsby (On the Road Cat). More will be known about this handsome fellow after he has a chance to settle into retirement. Indy with his new dad and mom. Congrats to the new family! 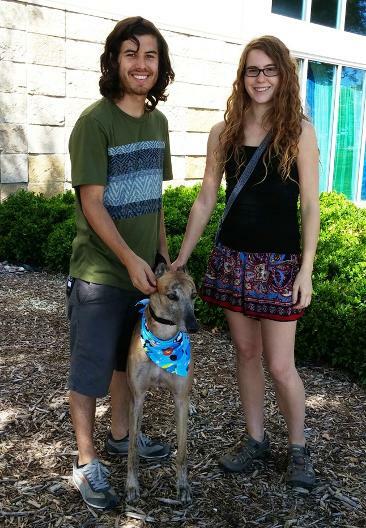 September 12, 2015 update: Indy went to his new forever home. Congrats to all! August 10, 2015 update: Indy is docile around people and other dogs (although reactive to the cats). Having just returned from the track he is strong and highly muscled and still somewhat in “race mode”. He considers gates and doors an invitation to run through them. 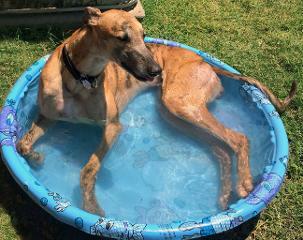 All openings are “gates” to him and if you are not careful, he will be “off to the races!” He loves to play in the kiddie pool (and of course, the mud around it). 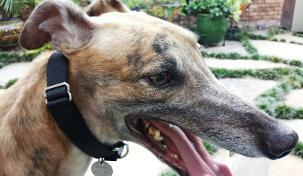 Indy is a very sweet, friendly boy that loves people. 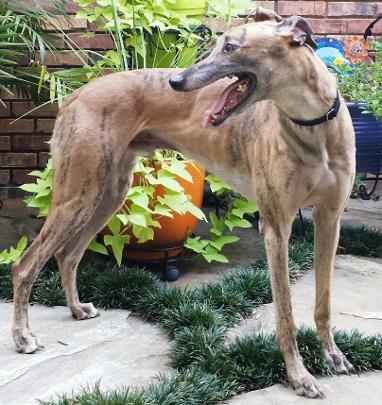 August 7, 2015 update: Indy came to TAGS for a life of retirement and to find his loving lifetime home.